Get the full bidding documentation from the Autodesk® Revit® model. Cost-It, the Presto plug-in for Revit, generates the bill of quantities and the priced estimate from the information contained in the BIM model, with all the data and specifications required to assign unit prices, prepare tender documents and check the project without delivering the model itself. From the model to the bid and the estimate. The elements in the Bill of Quantities are classified by Revit categories, families and types, in approximate order of execution. Any international standard classification system may be used, as Uniformat, MasterFormat, UniClass and OmniClass. The thumbnail image is attached to every type for easy identification. Each element has its geometric dimensions attached, as needed to calculate the quantity, as well as other useful values to complete the information. Quantities of work items not built into the model, such as forms or finishes, may be deducted from existing work items quantities using the exclusive Presto cross reference system. Holes appear next to its walls, allowing to dynamically substract the area, according to its size. Types may be optionally split in materials, all of them or only those formed by layers, getting their specific quantities, instead of the type global amounts. Graphically identify each item in the model simply by selecting it in the Presto window and placing the cursor on Revit. You will get all elements grouped and priced by levels, taking advantage of all Presto features for activities. Each element is also linked to its zone, if defined, and assigned to its construction phase in the model. Elements may be separated by options and variants. The variants may be dynamically activated in Presto for comparing alternate costs. List of rooms with their areas and other properties, getting the usable area and perimeter to calculate floor, ceiling and wall finishes. 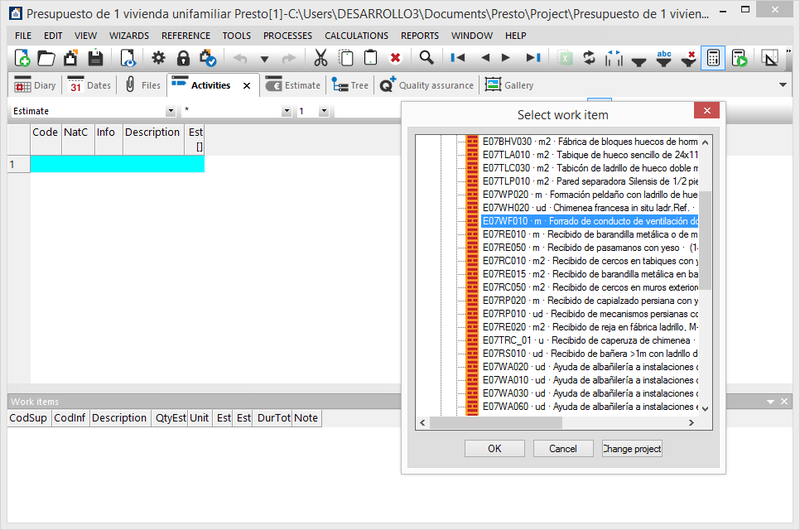 The complete list of item parameters allows to filter and sort by any of them, printing a selection in the estimate. 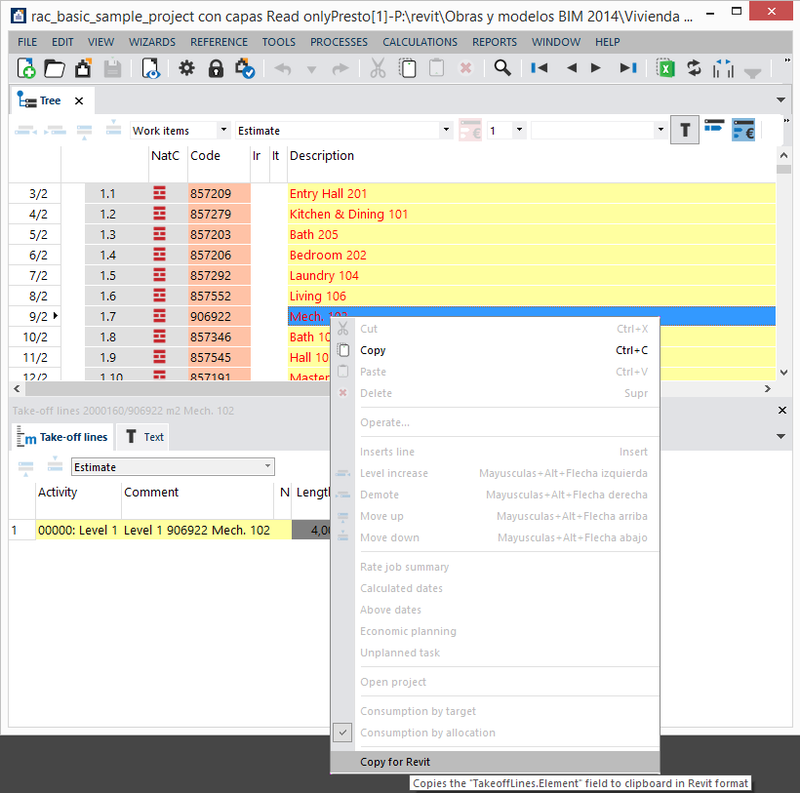 Modified values may be reinserted in the Revit model (available Jan. 2015). Optionally, attach within the Presto file all DWG plans and JPG defined views, or even the full IFC model, for delivering to the cost responsible or as a part of the tender documentation. All information necessary to evaluate and bid the project is packed in a single Presto format file that can be sent to other Presto users, consulted with a free viewer or exported to Excel, Access, Primavera, Project and other software. If the unit cost lies in the corresponding field in the BIM model, the resulting bill of quantities will be already priced. In other case, types may be linked to work items in external unit price databases or construction product catalogs. In this way actual market price, specifications, break downs and other associated information will be automatically inserted in the estimate. Use Presto options to detect changes or to selectively update the model, identifying new, deleted and modified items, keeping data from Revit isolate from other data. Re-enter in the BIM model information modified in the estimate, as the unit prices, the measurement unit, the short description, parameter values, and also the planning phase and the real execution phase of each element.